Justin Houston was a four-time Pro Bowler with the Chiefs. INDIANAPOLIS — Indianapolis Colts general manager Chris Ballard kept insisting he would be judicious in free agency. For two-plus years, he was. On Wednesday, a week after the first big wave of signings, Ballard opened his checkbook and made the biggest acquisition of his tenure by adding Justin Houston. Ballard didn’t just add a proven pass rusher; he brought in someone he knew well from his days in Kansas City, someone he believes fits the Colts’ young locker room, and a player who can still be effective when taking on extra blockers. Houston considered it the perfect combination for his skills. The 6-foot-3, 258-pound four-time Pro Bowler was a key part of the Chiefs’ defense, making 377 tackles in 96 starts. Houston’s 78½ career sacks rank fourth since he entered the league, and he was a first-team All-Pro in 2014, when he won the NFL’s sacks title. His 22 sacks that season are still tied for the second-highest single-season total in league history. 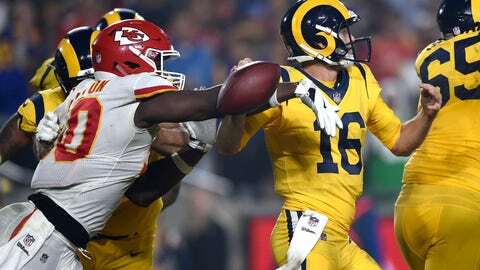 But with Houston turning 30, a high price tag and the Chiefs switching from a 3-4 defensive front to a 4-3, he suddenly became expendable. Houston also will help boost a line that includes Hunt, Jabaal Sheard and Denico Autry, and he can’t wait to get started. Houston started 12 games at outside linebacker in 2018, recording 37 tackles and nine sacks while forcing five fumbles and picking off one pass.